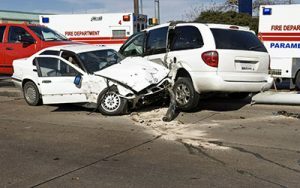 Motor Vehicle Accidents Category Archives — Page 2 of 13 — Massachusetts Injury Lawyer Blog Published by Boston, Massachusetts Injury Attorneys — Breakstone, White & Gluck, P.C. Driving to your Thanksgiving destination can be demanding. Read our tips to help you get there safely with a little less stress (if that’s possible). We all want to know the secret to beating the Thanksgiving week traffic out of Boston. To help, we have put together a few travel tips. Please travel safely, be patient and enjoy this special time of year with your family and friends. Traffic Apps and Resources. 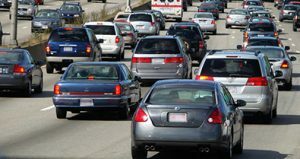 Here are a few websites for travelers: Boston.com/Traffic or Mass511.com. Traffic apps: Google Maps, Waze, AAA or GoTime. Boston’s Worst Traffic Bottlenecks. 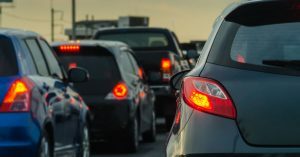 AAA is reporting on the Boston region’s 10 top traffic bottlenecks for the Thanksgiving holiday weekend. They include several locations along Interstate 93, Interstate 95 and the MassPike (Interstate 90). Read the full list now before you drive. Try to avoid them if you can. Check Your Car. Whether you drive your own car or rent a vehicle, spend a few minutes in the driver’s seat before you leave. Make sure you know how to use key features such as the blinkers, headlights and the heating system. Many new vehicles now have complex infotainment systems. Decide now what features you need to use for this trip – and which are distractions. Essentials. Make sure your motor vehicle registration is in your glove compartment and that you have your health insurance card (or cards if you are a parent traveling with children). Choose the Best Travel Times. AAA predicts a 3 percent increase in holiday travel this year, so we know to expect more traffic. Tuesday night and Wednesday afternoon will be the most challenging time, according to Waze. Another busy travel time is Thanksgiving Day between 11 a.m. and 1 p.m.
Plan to Stop. Take a break to fend off fatigue and let kids burn off energy. Stop once every two hours. Gas Up and Emergency Kit. Always start your trip with a full tank of gas. Then, make sure you have a strong emergency kit, with jumper cables, a quart of motor oil, coolant, a first aid kit and a toolkit. Find your auto club membership, a safety vest, a flashlight with extra batteries and a roadside flare. Finally, pack warm clothes, blankets and your cell phone charger. Commit to Use Your Cell Phone Safely. Our best tip for you is to turn your phone off. If you are traveling with someone, ask them to hold your cell phone and receive occasional phone calls or traffic alerts for you. When traffic is heavy, a driver can cause a multi-car pile-up with a single glance at a cell phone – and that’s on any given day. The traffic is much worse during the Thanksgiving Week. That is why texting while driving is banned in Massachusetts and 46 other states, and why many are pushing to see Massachusetts ban all cell phone use by drivers. No Drinking and Driving Accidents. Drunk driving accidents increase during the holiday season, starting with Thanksgiving week. Always, always travel with a designated driver who agrees not to drink. Or do not consume alcohol. No one ever regrets making this decision the next morning. There was a sad story in Westford over the weekend, when a woman was hit and killed in a Market Basket parking lot. Police are still investigating, but according to media reports, the 64-year-old woman was putting groceries into the back of her Toyota Highlander SUV, which was hit by another vehicle. The impact caused her SUV to roll back on top of her. This is not an isolated accident. 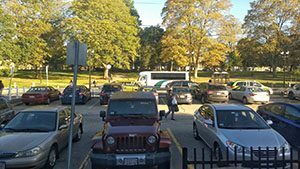 Parking lot accidents and backovers are frequently reported in every community in Massachusetts, from Boston and Cambridge to Worcester and Framingham. But the latest accident raises the questions: have parking lots become as dangerous as the roads? And what can be done to improve safety? We should all be able to shop safely. AAA reports 14 percent of all car accidents take place in parking lots. These can range from minor incidents, such as fender benders or someone opening a car door and hitting another vehicle. Other times, someone is seriously injured or killed, from backovers or speeding drivers. Fatal car crashes in the U.S. rose more than 5 percent in 2016, according to the National Highway Traffic Safety Administration. The roads were far more dangerous in 2016, with 37,461 people killed in motor vehicle crashes across the U.S. This represents a 5.6 percent increase over 2015. Passenger and motorcyclist deaths reached an 8-year high. More cyclists and pedestrians were killed than in any year since the early 1990s. The National Highway Traffic Safety Administration recently released the 2016 figures from the Fatality Analysis Reporting System (FARS). 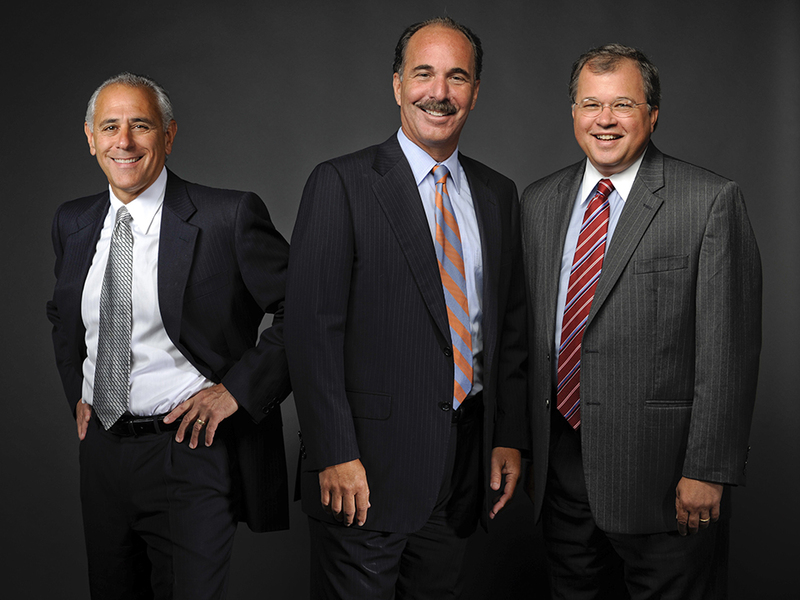 Attorneys Ronald E. Gluck, Marc L. Breakstone and David W. White, partners of the Boston law firm of Breakstone, White & Gluck. For more than 25 years, the firm has represented motorcyclists and others injured by reckless and negligent drivers. Motorcyclists, before you start your engines, remember to check your Massachusetts auto insurance policy. Too many motorcyclists do not have enough coverage, which can be a costly and painful mistake if you are ever injured in a crash. For more than 25 years, Breakstone, White & Gluck has fought to obtain compensation for motorcyclists injured by negligent drivers. In recent years, our attorneys have vigorously pursued settlements of $3.75 million, $3.5 million and $1.25 million for three motorcyclists. We write about these Massachusetts motorcycle settlements on our website. We work with auto insurance policies on a daily basis as we represent those injured on the road. We hope you are never injured, but it pays to plan and understand your auto insurance policy. After an accident, you may have to look to your own insurance policy, even if another driver caused the crash. In Massachusetts, all drivers and motorcyclists must buy a minimum level of auto insurance. This is known as Compulsory Coverage. Motorcyclists need more and have a few special considerations. Your challenge is to identify what your potential needs would be following a crash. To start, you would need coverage for medical treatment and lost wages. Depending on the nature of your injury, you may be out of work for an extended period or worse, be left unable to return full-time. If you have a family and provide income for their support, you have more to consider. The attorneys of Breakstone, White & Gluck have over 100 years combined experience representing motorcyclists in the Boston area and across Massachusetts, from Brockton and Plymouth to Cape Cod to Framingham and Worcester. If you have been injured, take the time to learn your rights from one of our Boston motorcycle accident lawyers. Our attorneys can help you answer the key questions you may have following a motorcycle accident, such as “How much is my motorcycle accident claim worth?” and “How long will it take to obtain compensation for my injury after a motorcycle accident?” For a free legal consultation, contact us at 800-379-1244 or 617-723-7676 or use our contact form. Over the past year, Boston, Cambridge and several other communities have lowered default speed limits from 30 to 25 mph, with a goal of creating safer streets for pedestrians and cyclists. Now it is Quincy’s turn. 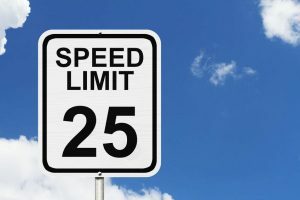 Last week, the Quincy City Council passed a measure establishing a speed limit of 25 mph, unless another speed limit is posted. The previous speed limit had been 30 mph. Once Mayor Thomas P. Koch signs the new law, officials will decide on an effective date. In January 2017, the City of Boston dropped its default speed limit from 30 to 25 mph. Lowering the speed limit was a key part of the Vision Zero Boston campaign, which was launched by Mayor Marty Walsh in 2015. The goal is to end traffic deaths and serious injuries in the City of Boston by 2030, through a combination of efforts, such as reducing speeds, eliminating distracted driving, and improving infrastructure for safer riding, walking and cycling. While lowering speed limits was a critical step, the City of Boston was unable to act right away. First, the city had to obtain approval from the state Legislature and Gov. Charlie Baker. Baker signed the Municipal Modernized bill in August 2016, which gave Boston, as well as cities and towns across the state, authority to reduce the default speed limit on local roads. There is strong evidence that slower traffic means safer streets. An excellent example is New York City. In 2014, the city lowered speed limits to 25 mph on 90 percent of its streets. Over three years, traffic fatalities have decreased 23 percent and fell to the lowest number in the city’s history in 2016. Boston city officials say that when crashes happen, faster vehicles are likely to cause the most serious injuries and fatalities. According to the City of Boston website, at 20 mph, there is a 17 percent likelihood that someone will be seriously injured or killed. At 40 mph, there is a 79 percent likelihood. Slower vehicles can be stopped more quickly, and the slower speeds allow for longer reaction times. Here is another reason for Massachusetts and other states to consider passing laws which ban handheld cell phone use by drivers. A new study reports one in four drivers who crashed was using a cell phone within the previous minute. Cambridge Mobile Telematics released the study last week to coincide with April’s Distracted Driving Awareness Month. Our country needs a reminder this year. Motor vehicle accident deaths are on the rise, as the National Safety Council reported nearly 40,000 deaths in traffic crashes last year. In fact, the period from 2014 to 2016 saw the largest two-year increase in more than 50 years. Meanwhile, this year has already seen hundreds of deaths across the U.S. Just last month came a horrific accident in Texas. A driver in Uvalde County, who was texting while driving his pick-up truck, crashed into a church bus, killing 13 people. Texas is one of 5 states which do not ban texting while driving. Attorney Marc L. Breakstone was quoted as a legal expert in a Boston Herald article titled “In Driver’s Seat With Insurance” (March 31, 2017). NuTonomy, the self-driving car company now testing its hands-free technology in Boston, has taken out a $5 million insurance policy to guard against lawsuits. Earlier this month, a self-driving Uber vehicle was involved in a car accident in Tempe, Arizona. Police found the Uber vehicle was traveling at 38 mph, below the speed limit, when the collision occurred and was not at fault. While there were no serious injuries, the accident has raised concerns. Attorney Breakstone was asked whether the City of Boston could be held liable if there is an accident involving NuTonomy. He said no, but read his full answer. Attorney Reza Breakstone has written on the topic of self-driving cars and the legal questions they raise. 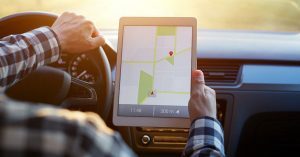 In 2016, he co-wrote an article titled, “The Self Driving Car: Science Fiction Becomes Reality, Creating a Legal Quandary,” for The Litigator, the official publication of the Capital City Trial Lawyers Association in Sacramento, California. Will Massachusetts Pass a Handheld Cell Phone Ban for Drivers? As attorneys, we have represented hundreds of victims of motor vehicle crashes over the past three decades. In recent years, we have seen texting while driving and cell phone use by drivers multiply at an alarming rate, causing a stunning number of injuries and deaths. These injuries are preventable, but each year, drivers continue to reach for their phones and the toll rises. According to the US Department of Transportation, cell phones are now involved in 1.6 million auto crashes each year, injuring 500,000 people and causing 6,000 deaths. 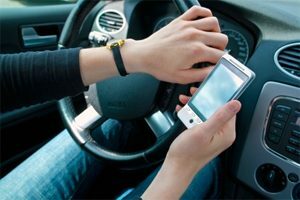 While many states have already passed legislation to reduce distracted driving accidents, some are now considering additional measures, including Massachusetts. Massachusetts lawmakers passed the Safe Driving Law in 2010, which banned texting while driving. There was no further action until January 2016, when the Massachusetts state Senate passed a bill banning handheld cell phone use. The ban would have allowed drivers to use hands free technology to dial and talk. 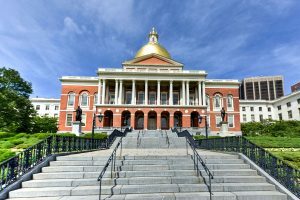 According to the State House News Service, the Massachusetts House of Representatives gave initial approval to a similar bill but the legislation stalled. There was no update for several months. Then Governor Charlie Baker spoke in February, indicating he may not support a handheld ban. “I don’t want to get out of the business of making it possible for people to talk to other people when they’re driving. Because I think the texting thing is a big problem. I’m not sure I believe that the talking thing is,” Baker said during his “Ask the Governor” segment on WGBH Thursday. His comments were published by the State House News Service. When texting while driving was banned in 2010, texting was the major concern for distracted driving, the Herald wrote. Today, more people have smartphones which offer quick access to social media and other apps. How Widespread is Texting While Driving in Massachusetts? Critics say enforcement for Massachusetts’ texting while driving ban is challenging when drivers can hold their phones to talk, but not for other purposes. Police have worked through some of these issues. According to a Boston Globe analysis, Massachusetts police officers wrote 6,131 tickets in 2015, compared to 1,153 in 2011, the first year of the ban. Overall, between late 2010 and mid-April of 2016 when the analysis was published, 18,383 tickets were issued for texting while driving in Massachusetts. Drivers under 40 years old received the most tickets and many drivers got caught during Distracted Driving Awareness Month, when many local police departments receive safety grants for enforcement. Massachusetts is one of 46 states which have texting while driving laws. Just 14 states also ban handheld cell phone use, according to the National Conference of State Legislatures. New Hampshire, Vermont and Connecticut are among the early adopters. Expect to hear more debate about a handheld cell phone ban in Massachusetts at some point in the future. 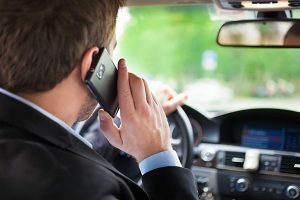 While Governor Baker has voiced reservations, when the 2017-2018 legislative session began in January, the Massachusetts House of Representatives referred legislation for hands-free cell phone devices to the Legislature’s Joint Committee on Transportation. Safety campaigns are critical to preventing distracted driving accidents. There are many out there, offering programs for schools and information online. One effort is from the Massachusetts Academy of Trial Attorneys (MATA), which brings its “End Distracted Driving” program to high schools. We support this campaign. Two of our partners, Marc L. Breakstone and Ronald E. Gluck, serve on the MATA Board of Governors. Partner David W. White is a long-time member. 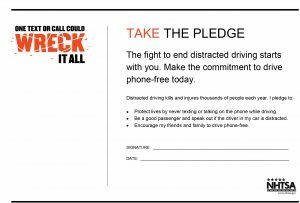 Another effort comes from the National Highway Traffic Safety Administration (NHTSA), which offers this pledge which family members can sign to promise each other they will not use a cell phone while driving. Distraction.gov: Official U.S. website for distracted driving. It Can Wait! : AT&T’s documentary to stop distracted driving.